Explanations, first: Yes, our lead photo (above) depicts a glass of a very dark liquid with a foamy head. And, yes, that pattern on the glass really is a QR code, the fancy computer-generated barcodes you're starting to see just about everywhere. 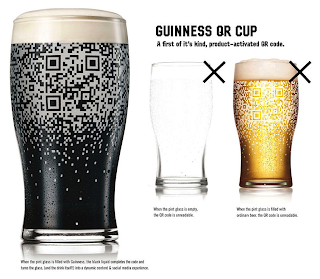 To be specific, the fluid is Guinness Irish stout beer, made by the world-famous Irish brewers Guinness & Co.; the unusual container is a Guinness 'QR cup' -- a beer glass with etched QR code -- and that's the creation of world-famous New York ad agency BBDO. Beer advertising is nothing new and a 287 year-old company like Guinness has carried out their fair share of unorthodox promotional schemes. Most recently, they decided it was time to reinvigorate the brewery's old-world image for a 21st-century clientèle. The trick was to be hip while still reminding us of the old-school charms that make their beer so memorable. BBDO came up with a brilliant pitch: turn the very act of enjoying a pint of Guiness -- holding it, tasting it -- into an interactive experience. Is Guinness encouraging discrimination on the basis of color? And the new QR cup does exactly that, in more ways than one. First off, the Guiness QR cup is (in a very real sense) 'activated' by the product. Etched on the glass' inner surface, the QR code is barely visible -- and, thus, entirely unscannable -- until the glass is filled with a perfect pour of stout, providing a dark-colored background. The beauty of this is that you need a stout (or, say, Guinness' Black Lager) to make the glass 'work'. Most other brews are too light in color, so they appear weak in comparison. Also, you must fill the glass with just enough Guinness to leave room for a flawless head. "[...] tweets about your pint, updates your Facebook status, checks you in via Foursquare, downloads coupons and promotions, invites your friends to join you, and even launches exclusive Guinness content." The beauty of this is...Ok, to be honest MobilePhonesFan isn't crazy about all the tweeting, surfing, etc. Not all at once, anyway, especially if we've been drinking. Certainly not if we're out with friends. 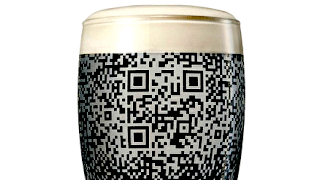 Guinness should add a TMI warning on the glass, above the QR. Still, an excellent job by BBDO. We hope this promo eventually finds it's way to the USA.